View the most beautiful regions of Switzerland whilst riding on an electric bike! 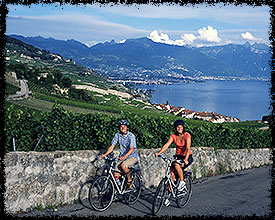 Many regions in Switzerland offer the possibility to practice cycling. However, not everyone has the energy needed to climb the famously steep mountain roads. The electric bike gives everyone the opportunity to travel 100 km a day with ease, despite the steep hills. There are several tours available throughout Switzerland. For large groups please provide a reservation well in advance. This activity is ideal to combine with our other outdoor activities.